Over the thirteen year span (1962-1975) of the 1000 cover series, the Postal Service increased the first class postage rate four times. In 1962 the rate (existing from 1958) was 4 cents, it increased to 5 cents in 1963, to 6 cents in 1968, to 8 cents in 1971, and to 10 cents in 1974. 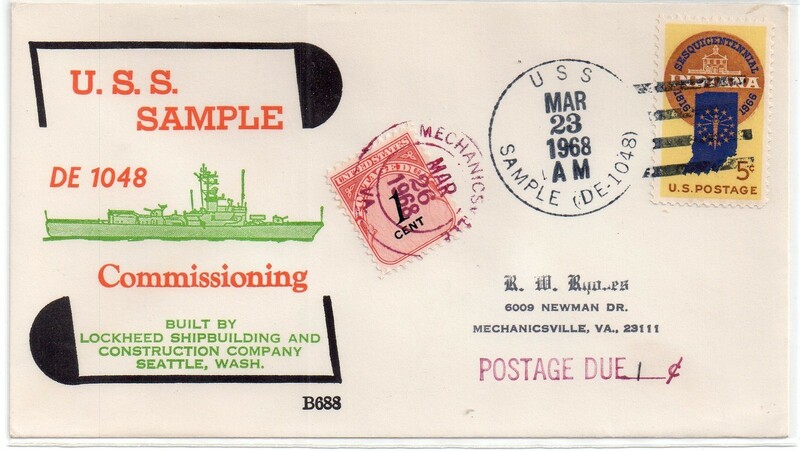 The procedure that Beck’s cover serviced was simple, collectors send 25 stamped self-addressed envelopes to Beck for servicing. Collectors were asked to place a insert into the envelope to add a little bulk to the envelope. Along with the 25 envelopes sent to Beck for servicing was a self address postcard to notify the collector that more envelopes were needed. The service fee was only pennies per cover and likely never fully covered Beck’s costs. He did this service out of love for the hobby. Beck planned his series of covers according to the upcoming events. He prepared his covers and shipped them in bulk to the ship yard or US Navy ship accordingly. Sometimes the cover was sent months in advance. By the time Beck worked through the 25 covers and the covers arrived for postmarking, sometime a postal increase happened. Beck did the best he could to anticipate postal increases which weren’t always announced far in advance. On a number of covers, Beck added a 1 cent stamp of his own to collector’s covers to make sure it had enough postage. Sometime he wrote a note on the back of the cover “postage added” to alert the collector that Beck was owed for the extra postage. It is very interesting to view the 1962-1975 series of 1000 covers to understand how postal rates affected cover collecting. Another very interesting point is to examine all the different styles and qualities of envelopes submitted by collectors. You will see every style imaginable. Some of the more popular envelopes are the Postal Service Postal Stationery envelopes and the red-banded Air Mail envelopes.